What does the KDL-60R550A have that the KDL-60R520A does not? 3D is the answer, passive 3D to be more specific. Other than that the screens are identical except maybe slight appearance differences. The KDL60R520A has Wifi, Smart TV options with Sony's Entertainment Network, Motionflow 240 from the 120Hz panel, USB ports and playback, Screen mirroring via Wifi (for Smart phone use NFC compatible devices), and DirectTV DVR direct service without additional receivers. From the matte-type screen finish you get good black levels in the top and bottom bars of the screen (16:9 content) but not as much with images on screen. There is a bit of glare off the matte screen from in-room light but colors are realistic and enjoyable. Light throughput is not as brilliant as it is on some clear coat LED panels. On the positive side Sony's processing is excellent so image edges are very clear partly due to the clear resolution enhancer technology built in the KDL60R520A. Edges are crisp and sharp. This is a bang for the buck type of TV by leaving off 3D, and focusing on size Sony has joined Sharp in the price per square viewing inch focus category. This is a well priced strong value 60” LED TV. 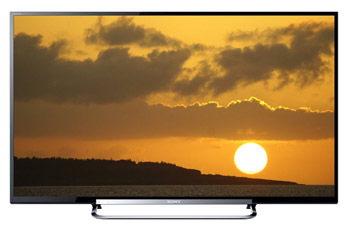 Competition is from the Sharp LC-60LE757U series, LG 60LA6200 and Samsung UN60F6400 models, along with some stiff plasma TV competitors like Panasonic and Samsung.